One of the largest panoramic images ever taken with Hubble's cameras has been released to celebrate the 17th anniversary of the launch and deployment of the NASA/ESA Hubble Space Telescope. The image shows a 50 light-year-wide view of the tumultuous central region of the Carina Nebula where a maelstrom of star birth - and death - is taking place. Hubble's new view of the Carina Nebula shows the process of star birth at a new level of detail. 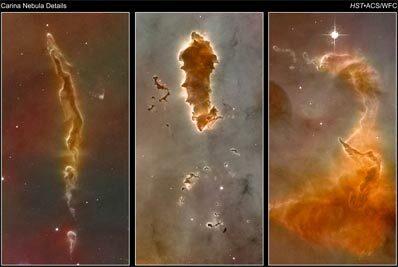 The bizarre landscape of the nebula is sculpted by the action of outflowing winds and scorching ultraviolet radiation from the monster stars that inhabit this inferno. These stars are shredding the surrounding material that is the last vestige of the giant cloud from which the stars were born. This immense nebula contains a dozen or more brilliant stars that are estimated to be at least 50 to 100 times the mass of our Sun. The most opulent is the star eta Carinae, seen at far left. Eta Carinae is in the final stages of its brief eruptive lifespan, as shown by two billowing lobes of gas and dust that presage its upcoming explosion as a titanic supernova. 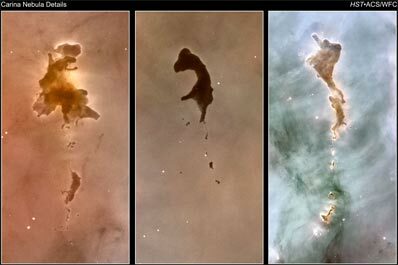 The fireworks in the Carina region started three million years ago when the nebula's first generation of newborn stars condensed and ignited in the middle of a huge cloud of cold molecular hydrogen. Radiation from these stars carved out an expanding bubble of hot gas. The island-like clumps of dark clouds scattered across the nebula are nodules of dust and gas that have so far resisted being eaten away by photoionisation. The hurricane-strength blast of stellar winds and blistering ultraviolet radiation within the cavity is now compressing the surrounding walls of cold hydrogen. This is triggering a second stage of new star formation. Our Sun and Solar System may have been born inside such a cosmic crucible 4.6 billion years ago. In looking at the Carina Nebula we are seeing star formation as it commonly occurs along the dense spiral arms of a galaxy. This immense nebula is an estimated 7,500 light-years away in the southern constellation Carina, the Keel of the old southern constellation Argo Navis, the ship of Jason and the Argonauts from Greek mythology. This image is an immense (29,566 x 14,321 pixels) mosaic of the Carina Nebula assembled from 48 frames taken with Hubble's Advanced Camera for Surveys. The Hubble images were taken in the light of ionized hydrogen. Colour information was added with data taken at the Cerro Tololo Inter- American Observatory in Chile. Red corresponds to sulphur, green to hydrogen, and blue to oxygen emission.